So far, we have enjoyed how different AzhwArs enjoyed archAvathAra emperumAns. Please see http://ponnadi.blogspot.in/p/archavathara-anubhavam.html for the full list. We will now start seeing how our pUrvAchAryas enjoyed archAvathAra emperumAns. We have seen from the beginning that emperumAn is full of divine qualities. emperumAn's divine qualities can be divided into 2 categories - parathvam (supremacy) and saulabhyam (simplicity, easy accessibility). vEdhAntham establishes emperumAn's parathvam clearly. It is said in the chAndhOgya upanishadh that "kAraNam thu dhyEya:" which means the object of our worship/meditation should be the root cause of everything. In the beginning of brahma sUthram, vEdha vyAsa maharishi also establishes that "athAthO brahma jijnAsa" (now that karma kANdam of vEdham is understood, one should understand about brahmam) and "janmAdhy asya yatha:" (that brahmam is the root cause of everything). In the thaithriya upanishadh, it is said that "yatho vA imAni bhuthAni jAyante; yEna jathAni jIvanthi; yat prayanthyabhisamvisanthi; thadh vijijnAsasva; thath brahma" which means "brahmam is that from which everything is created, everything is sustained and finally everything is consumed". In nArAyaNa upanishadh, it is established that "nArAyANAth brahmA jAyathE, nArAyaNath rudhrO jAyathE, etc" - sriman nArAyaNan created brahmA, shiva, air, directions, etc and his all pervasive nature (omni presence) is wonderfully established. In aruLicheyal also, AzhwArs establish emperumAn's parathvam in several places. nammAzhwAr says "oththAr mikkArai ilaiyAya mAmAyA" (ஒத்தார் மிக்காரை இலையாய மாமாயா) - one who does not have anyone equal or higher. He also says "onRum dhEvum ulagum uyirum maRRum" (ஒன்றும் தேவும் உலகும் உயிரும் மற்றும்) - on whom all the chEthanams and achEthanams go and submerge during praLayam. piLLai perumAL iyengAr who was a great thamizh poet and a great srivaishnava who lived in srirangam says "One person (thrivikraman emperumAn) is lifting his lotus foot, another person (brahmA) is washing that foot with his hands and yet another person (rudhran) is holding that sri pAdha thIrtham in his head with reverence. Now, you decide who is supreme". He goes one step beyond and says that emperumAn's supremacy can be established through prathyaksha pramANam (what is visible to our eyes, etc) itself. He says "brahmA who is the first being in the material creation appearing from emperumAn's navel is easily seen in archAvathAra emperumAn". Thus emperumAn's parathvam is established. emperumAn's saulabhyam is fully seen in archAvathAram and this is fully shown to us by AzhwArs through their dhivya prabhandhams. 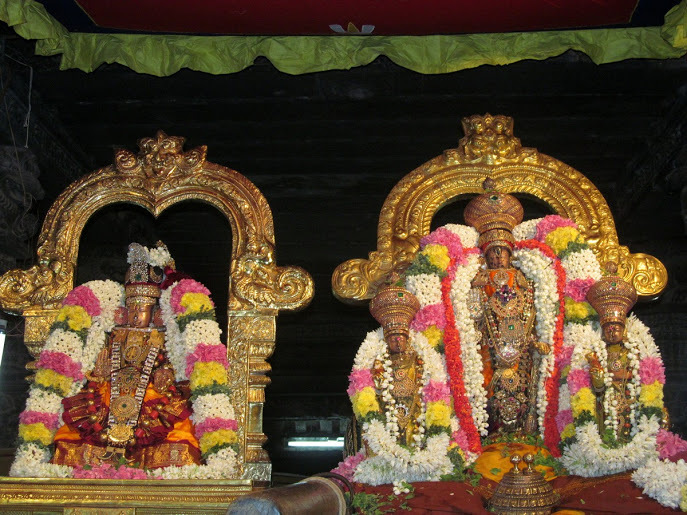 AzhwArs have always engaged themselves in meditating on archAvathAra emperumAn and glorifying him. Even though he is supreme, he manifests the pinnacle of his saulabhyam in archAvathAram by becoming fully subservient to his devotees. He takes the form that is desired by his adiyArs. He keeps the name that is desired by his adiyArs. And he fully depends on them for his bathing, dressing, eating and all other activities such as thiruvArAdhanam, purappAdu (procession), uthsavams (celebrations), etc. parAsara bhattar explains this quality of emperumAn as "archaka parAdhIna: akilAthma sthithi:" - he becomes fully subservient to the one who worships him and depends on that worshipper for sustaining himself. In archAvathAram, emperumAn maintains archA samAdhi (not showing any visible interactions with anyone). But there have been great mahAns over the past in charithram (history), who were so advanced in their nishtai with great attachment towards emperumAn which made emperumAn break his archA samAdhi and have regular interactions with them. One such great personality is thirukkachi nambi who is also known as "sri kAnchi pUrNar". 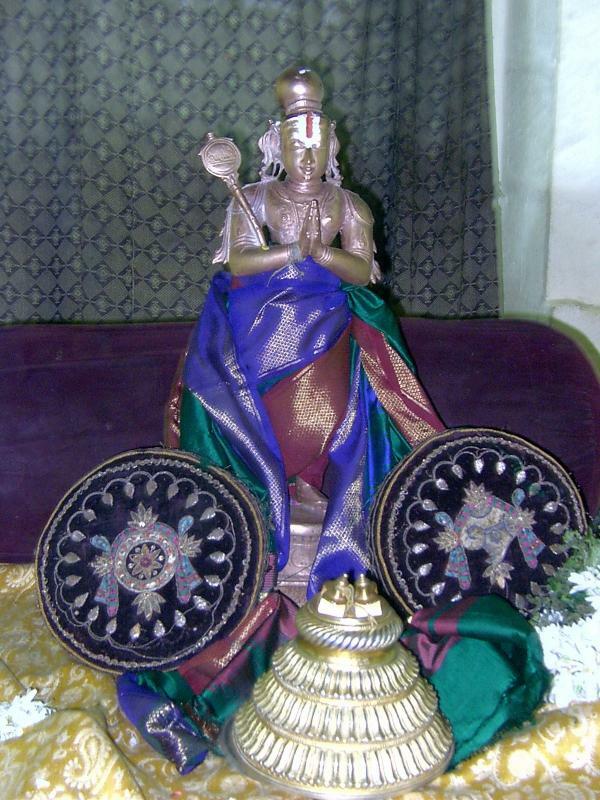 He was one of the prime disciples of ALavandhAr and he served dhEva perumAL (varadharAjan emperumAn of hasthigiri/kAnchipuram) by performing thriuvAlavattam (hand held fan) kainkaryam to emperumAn. mangaLAsAsanam to dhEva perumAL who resides in hasthigiri and who out of great love towards thirukkachi nambi, broke his archA samAdhi and regularly had conversations with him. thirukkachi nambi and dhEva perumAL had a unique and great relationship that emperumAn was having great attachment to him and also constant interactions with him. emperumAnAr had great abhimAnam for him. emperumAnAr considered thirukkachi nambi as his AchArya and in fact wanted to accept samAshrayaNam from him. But thirukkachi nambi cited varNAshram dharmam and refused to perform samAshrayaNam for emperumAnAr. It is well known that thirukkachi nambi was doing continuous kainkaryam and conversing regularly with dhEva perumAL. azhagiya maNavALa perumAL nAyanAr glorifies him along with thiruppANAzhwAr (we have already seen his anubhavam in http://ponnadi.blogspot.in/2012/10/archavathara-anubhavam-thiruppanazhwar.html) and kurumbarutha nambi in AchArya hrudhayam chUrNikai 85 as "thyAga manNdapaththil Alavattamum kaiyumAna aNtharanGgarai vaidhikOththamar aNuvarththiththa kramam" (த்யாக மண்டபத்தில் ஆலவட்டமும் கையுமான அந்தரங்கரை வைதிகோத்தமர் அநுவர்த்தித்த க்ரமம்) meaning one will understand the greatness of a srivaishnava (going beyond the bodily conception) only when they understand that thirukkachi nambi who was a confidential servitor of emperumAn was admired and served by emperumAnAr who is the top most vaidhikar. It is also well known that he got the "6 vArthaigaL" (six words) from dhEva perumAL as requested by emperumAnAr to establish important meanings of our sath sampradhAyam. After ALavandhAr attaining paramapadham, emperumAnAr was thinking about who to accept as his AchAryan. Wanting to get his thoughts confirmed by dhEva perumAL, emperumAnAr approached thirukkachi nambi who was a confidential adiyAr of dhEva perumAL and asked him to find out emperumAn's thiruvuLLam (thoughts). When thirukkachi nambi informs dhEva perumAL during his kainkaryam that emperumAnAr has some doubts in his mind, dhEva perumAL gives him the following 6 instructions to be passed on to emperumAnAr. We have to note that emperumAnAr was thinking in his mind about AchAryan matter only, but dhEva perumAL out of his divine plan wants to establish certain principles that too directly through thirukkachi nambi who is his confidential devotee. Let us quickly see the 6 words that were blessed by emperumAn. ahamEva param thathvam - I am the supreme entity. dharshanam bhEdham Eva cha - sidhantham is bhedham, that emperumAn and jIvAthmAs are different, though emperumAn is the sarIri (soul) and all the chEthanams and achEthanams are sarIram (body). Just like we understand the jIvAthmA is different from the dhEham, paramAthmA is also different from jIvAthmA but there is an eternal relationship which ties paramAthmA, jIvAthmAs and achEthanams together. upAyEshu prApthisyAt - sharaNAgathi is the upAyam (means) to attain me. anthima smruthi varjanam - No need to think about me in the last moments. For prapannnas, I will think about them during their last moments. dhEvAvasAnE mukthisyAt - For prapannas, at the end of this life they will get mOksham (unlike bhakthi yOga nishtars who will get mOksham after exhausting the prArabhdha karmA). pUrNAchAryam samAshraya: - Accept mahApUrNar (periya nambi) as AchAryan. This last point is the only direct instruction to emperumAnAr while all other points are establishing the basic tenets of our sampradhAyam. thirukkAchi nambi has written a beautiful sthOthra prabhandham named "dhEvarAja ashtakam". These eight slOkams are his beautiful outpourings towards dhEva perumAL and let us enjoy a little glimpse from that prabhandham. 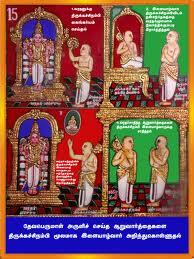 In the first slOkam, nambi performs mangaLAsAsanam and surrenders to 5 different manifestations of emperumAn. He glorifies emperumAn as "hasthisailEsha" (archAvathAram), "srIman" (param), "ambhuja lOchana" (vibhavam), "achyutha" (antharyAmi) and "praNathArthihara" (vyUham - kshIrAbdhi). In the second slOkam, he says emperumAn is the one who protects all beings, one who is full of mercy and one who is the proprietor of both nithya vibhUthi and leelA vibhUthi and asks emperumAn to bless him as well. In the third slOkam, he asks emperumAn to protect him because he is doing the acts that are prohibited in sAsthram and also not doing the acts which are mandated in sAsthram. He is also saying that he is full of sins and he requests for emperumAn's protection. Note: In our pUrvAchAryas works, we will observe a lot of naichyAnusandhAnam (where they declare themselves to be very lowly) - we must understand that they themselves are very pure and they are showing us how to think of ourselves when we go to emperumAn. In the next 5 slOkams, thirukkachi nambi shows the cruel nature of the samsAram and asks for protection from emperumAn. samsAram is like a dense forest, it is full of diseases which are like tigers and vishayams (sound, touch, vision, taste and smell) are like dense bushes and attachment towards these are like many trees in the forest. Wife (and husband), children, land, etc are mirages in a desert and they take away the analytical ability of the mind to distinguish between what is allowed in sAsthram and what is not. We are incapable in this samsAram to do many things. But still run around trying to do them, have great attachment towards these and end up with distress and sorrows always. Oh dhEvarAja who is full of mercy! king of the dhEvas! the lord of the worlds! protect me who is suffering in this samsAram. Please protect me by your merciful glances, and drench me in your mercy which is as cool as soft breeze and as likeable as the waves of an ocean. It was thirukkachi nambi's great attachment which showed us that archAvathAra empeumAn has great attachment towards his adiyArs and will do anything for them. Let us meditate on his divine lotus feet and pray for the same attachment towards emperumAn. In the next article we will see emperumAnAr's archAvathAra anubhavam. Swamy, can you please post the original text of devarajaashtakam so we can learn and chant. Thank you. included a scanned page of the prabhandham inline (before the explanation). Swami, nicely putup article, however my mandhamathi has some doubts in the above mentioned points. "upAyEshu prApthisyAt" - adiyen have heard in upanysams that here the word prapati is emperuman himself according to sathsampradayam, the meaning of this vaarthai is like he says "I am the best upayam" as we firmly believe the sadhyopayam prappati is not the upayam and only the sidhopaayam Emperuman is. "(unlike bhakthi yOga nishtars who will get mOksham after exhausting the prArabhdha karmA)." - heard that this is applicable for prapannas who get moksham after there prarabdam is over whereas Bhaktiyoga nistars get moksham only after all their karma is over. This has been emphasized in Malai nanni pravesam clearly. Please enlighten on the above points. thanks for feedback. Yes, sharaNAgathi, by definition means accepting bhagavAn as the only upAyam. And generally, prapaththi and sharaNAgathi are interchangably used. Though, there are subtle differences in the terms - prapaththi and sharaNAgathi depending on the context. regarding prArabdha karmA - as heard from elders and read in some granthams - for prapannas, mOksham is at the end of the same life and for bhakthi yOga nishtas, mOksham is at the end of the exhaustion of prArabdha karmA. It is important to note that sanchitha karmA is exhausted for both bhakthi yOga nishtas and prapannas. Actually, mAlai naNNi pravEsam nicely shows the difference between bhakthi and prapaththi. first, nampiLLai raises a question himself "in vEdhAntham, it is said that one gets mOksham at the end prArabdham and how can you say that you will get mOksham in the end of this life?" (indicating bhakthi yOgam) and then he says "there it is talking about upAsakas (bhakthi yOga nishtas) - for them its at the end of the prArabdha karmA. And here it is talking about prapannas - for them its at the end of this life itself". Thanks, It was an opportunity to clarify things. I agree with your comments on Prarabdha that a prappana has to enjoy only the prarabdha of the present life but a bhakti yoga nista has to completely clear it taking how many ever janmas. However i dont think the Prapati point which i raised was addressed clearly, the question is not about prappati or saranagathi but the meaning mentioned was misleading and did not reflect the heart of sathsampradayam. Then about Sanchitha karma, dhevar mentioned "It is important to note that sanchitha karmA is exhausted for both bhakthi yOga nishtas and prapannas." which is totally untrue. Actually prarabdha is a part of sanchitha and we are born to enjoy our prarabdha. Sanchitha is like a mountain of sins and prarabdha is a handpicked quantity which would take say 10 or 20 or 100 years to clear where we will be accumulating other sins also. It was a simple translation of the particular vArthai (without going into much details) - and as adiyen mentioned by definition saraNAgathy being upAyam means emperumAn is upAyam only (its straight meaning). In many places, this kind of enquiry of bhakthi/prapaththi as upAyam is done and prapaththi is determined as the best upAyam - some of these are to be understood according to the context (while we dont miss the underlying principle ofcourse). * sanchitha - the whole big bag of puNya/pApa we have accumulated thus far. * prArabdha - small part of that whole bag, which is taken out and that is to be exhaused over a span of few (not a specific number) births. In this, sarIra Arabdha is only considered for a prapanna. Also, being a prapanna any puNya/pApa accumulated knowingly and the ones that are not atoned for also, those need to be exhausted by the end of that birth. 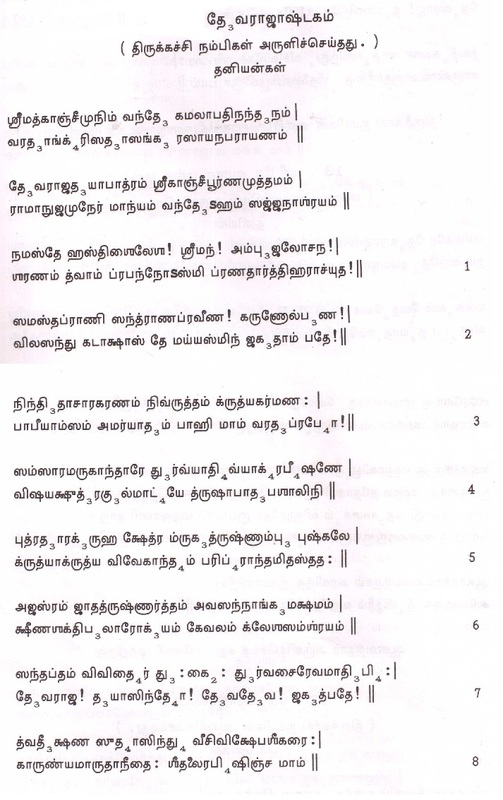 These are explained in sakala pramANa thAthparyam by periyavAchchAn piLLai. He also explains by definition "prapanna" will not engage in pApam knowingly. As mentioned before, sanchitha is exhaused for both bhakthi yOga nishtas and prapannas. Because the fact that bhakthi yOga nishtan goes thru prArabdha karmA as many births required unlike prapannas who only need to exhaust sarIra Arabhdha karmA only and then gets mOksham - itself is proof enough for sanchitha karmA being exhausted already for both categories (by the grace of emperumAn only). This principle of prArabdha karmA is nicely explained in thani charamam - "sarva pApEbyO" section. There the whole discussion starts only with prArabdha karmA as sanchitha karmA is already explained by vEdhAntham as that can be discarded by bhagavAn (out of mercy). Only prArabdha karmA needs to be exhausted by experiencing the results. Then piLLai lOkAchAryar explains how even the remaining prArabdha karmA is discarded by emperumAn for prapannas alone. BTW, you can probably identify yourself, so adiyen knows whom adiyen is talking to.